Tottenham scored a dramatic late winner as they came from behind to defeat Fulham 2-1 on Sunday evening. Fulham started the game brightly and took a rather fortuitous lead after 17 minutes. Fernando Llorente, starting in place of the injured Harry Kane, lost his bearings and managed to slice the ball into the back of his own net from a Jean Michael Seri corner, leaving Hugo Lloris helpless in the Tottenham goal. The hosts continued to impress for the remainder of the first half and they looked to have doubled their lead right before the interval through Aleksandar Mitrovic, only for the Serbian's celebrations to be cut short by the offside flag. Tottenham took no time at all to make an impression in the second half, finding an equaliser after five minutes. Following a mistake from Tim Ream, Christian Eriksen floated a cross into the Fulham box and Dele Alli headed the ball home emphatically. Mauricio Pochettino's side continued to mount the pressure, but it took until the final moments of the game before they were able to find a winner. Harry Winks was the hero for Spurs, nipping in ahead of Joe Bryan to head the ball beyond Sergio Rico, sealing a dramatic victory. ​Fu​lham's return to the Premier League has been far from ideal and in recent weeks their lack of potency at the top end of the pitch has been just as much of an issue as their defensive fragility. Their first half performance showed signs of huge improvement and they have to use that as the model for the rest of the season. They exhibited flair and creativity in the final third and they were able to successfully blend that with some old-fashioned grit and determination. Their levels dipped in the second half and the typical defensive mistakes began to creep back into their game - which led to their eventual defeat. It's the same old story for Fulham fans, who will no doubt be starting to lose hope with their side. Starting XI: Rico (6); Odoi (6), Le Marchand (5), Ream (5); Christie (7), Chambers (8), Seri (7), Bryan (6); Schurrle (5), Babel (7), Mitrovic (6). Substitutes: Sessegnon (6), Kebano (5), Cisse (N/A). ​Chambers has been one of Fulham's most consistent performers this season, but this was by far his most impressive showing. Claudio Ranieri's decision to field him as a defensive midfielder looks to have been a masterstroke as the Arsenal loanee has comfortably adapted to the previously unfamiliar position. His tidy footwork and neat passing got him out of plenty of tricky situations and he provided some necessary defensive cover for the leaky back line. Pay all the money for Callum Chambers. Take out a second mortgage on the stadium if you have to. All. The. Money. A difficult second half for Ream, who was at fault for Tottenham's equaliser and looked to be devoid of confidence thereafter. If Tottenham were at full-strength then the American could have been punished even further. Everything seems to have unravelled in the space of a week for Tottenham, with Harry Kane suffering an ankle injury, Son Heung-Min out on international duty and Mousa Dembele leaving for China. The immediate future is looking decidedly bleak for Mauricio Pochettino's side and this game proved that the absences of Kane and Son could prove to be season-defining. They looked out of sorts for the majority of the game and, whilst they were able to salvage a late victory, it was by no means convincing. They are on course for a top four finish, but the next few weeks could prove to be incredibly difficult, especially as it looks as if Dele Alli will be out of action after suffering a hamstring injury. Starting XI: Lloris (6); Alderweireld (6), Sanchez (5), Vertonghen (6); Trippier (5), Winks (7), Eriksen (5), Rose (6); Alli (6), Lamela (5), Llorente (4). Substitutes: Dier (6), N'Koudou (N/A). 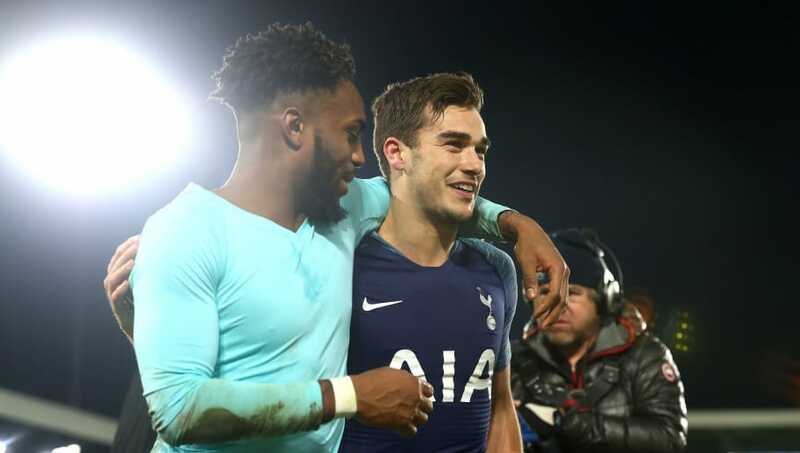 It was a difficult game for plenty of Tottenham players, but Winks looked pretty impressive in the centre of the park and was very efficient with the ball at his feet. He demonstrated a good range of passing and more than held his own against the physical Seri. He'll be remembered for his winning goal, but his overall game deserves some serious acclaim. Fitting that it was Winks because - although he was *far* from perfect - he was one of few that turned up today. Don’t think people understand how good Winks is, unbelievable player still only 22 sky’s the limit for him. There was a lot of pressure on Llorente's shoulders to fill Kane's boots, but he didn't exactly have a game to remember. He scored an own goal, missed plenty of chances and failed to hold the ball up on a number of occasions. Spurs have no other options up top, so they will be hoping that he can find some form sharpish. Fulham have over a week to prepare for their next match, a home tie against Brighton next Tuesday. As for Tottenham, they have a busy week ahead. They play the second-leg of their Carabao Cup semi-final against Chelsea on Thursday before facing Crystal Palace in the FA Cup next Sunday.